Land Rover’s new Disco Sport has just arrived in SA, but it has already been running around UK roads for a while, so journalist Lewis Kingston decided to pit the SUV against some of its biggest rivals. 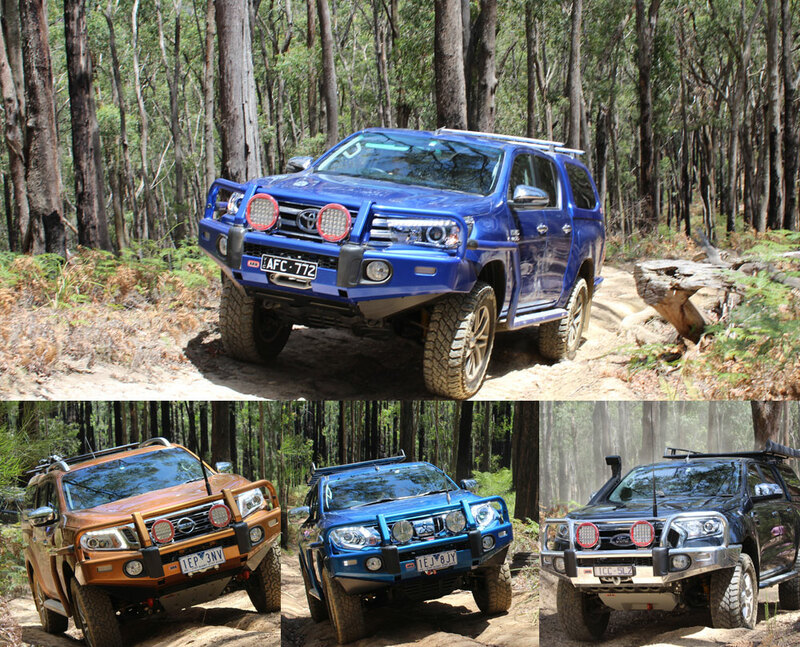 Does the Disco Sport have what it takes to tackle the BMW X3, Volvo XC60 and Hyundai Santa Fe? This is supposed to be a new take on the Freelander yet I’m confronted with an interior that looks and feels five years old. This pre-dated feel is reinforced with every turn of the four-cylinder diesel engine’s crankshaft, its coarse nature betraying the fact that it is actually five years old. And all of this, I idly muse, even though the Disco Sport is the newest and one of the more expensive options in its class. 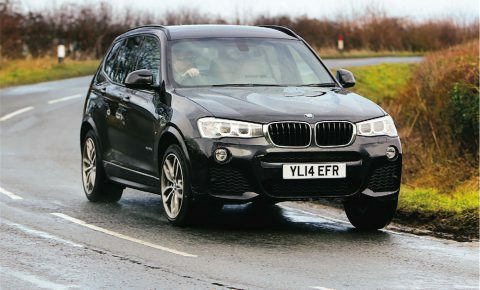 After all, when you are attempting to muscle in on a market occupied by the likes of the BMW X3 – frequently regarded as one of the best mid-sized SUVs on sale – then you really need to push the boat out. Your car needs to be competitive in every respect, if not exceptionally so, and offer several additional facets of reward in order to topple such heady competition. 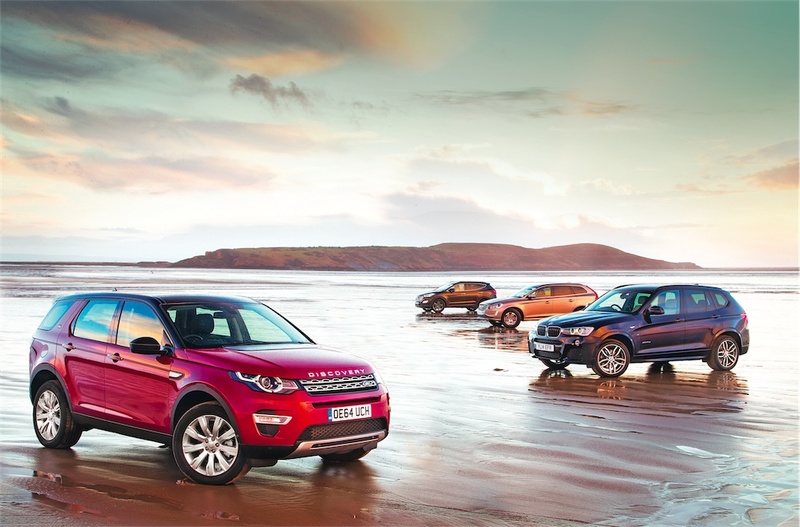 And the Discovery Sport doesn’t face competition only from Germany. 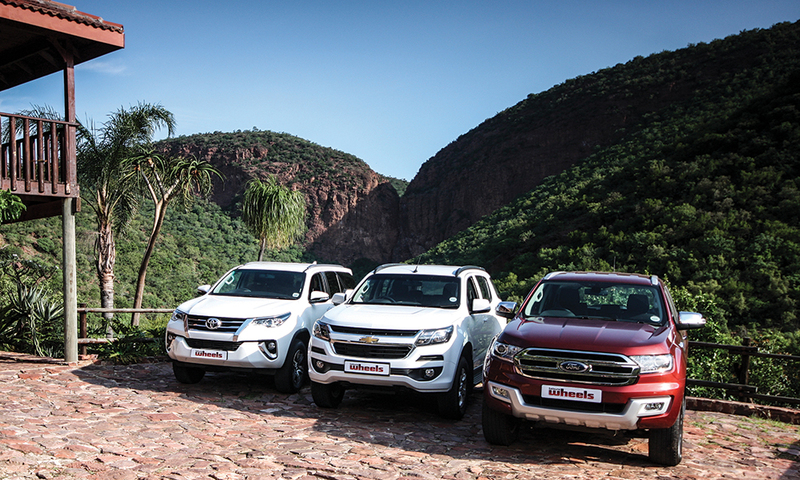 These days, every manufacturer is in on the SUV game, exploiting what has rapidly developed into a very lucrative sector. So, in order to find out whether the Land Rover really has what it takes to justify a place on your driveway, we are pitching it at a broad spectrum of alternatives. First to join the Discovery Sport just outside Swindon, prior to a cross-country trek that will put several hundred kilometres on the clock, is the Volvo XC60. It packs Volvo’s frugal new D4 engine, which isn’t offered with four-wheel drive yet, and is a quietly appealing car. It’s also one that, in most cases, wouldn’t appear out of place parked nose to nose with the new Land Rover in the high-end residential areas frequently occupied by these cars. Next into the starting blocks is the Hyundai Santa Fe. Like the Land Rover, it sports a diesel engine, four-wheel drive and seven seats. It may not have the badge or the off-road credentials, but what it excels in is value for money and ease of use. 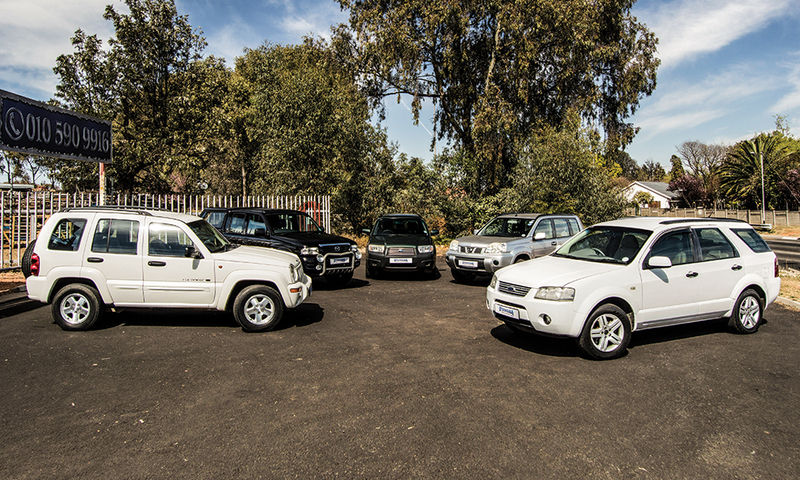 Lastly, the main threat – the five-seat, four-wheel-drive X3 – rolls in. 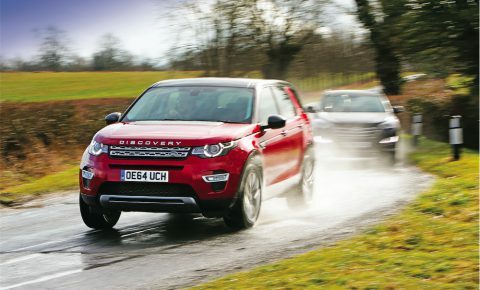 It’s this car that the Land Rover will have to work hardest to overcome, but that’s not to say the others are completely outgunned. It’s immediately apparent that the Land Rover is the one getting the most attention. Although I’m not personally sold on the “inflated Evoque” looks and the somewhat brash Discovery badge on the nose, the Land Rover is unquestionably the most interesting to look at. Some of that interest from passers-by might be lost when you tell them how much it costs, though. This flagship HSE version, in luxury specification, racks up the register at a wince-inducing R731 400 in SA. Compensation comes in the form of an equipment list that’s as long as your arm, including pleasantries such as a stout 11-speaker stereo and heated and cooled front seats, but it still feels like a hefty price for a four-cylinder diesel SUV. That said, the others may be cheaper at face value – the Volvo D4 is priced at R538 300, the Hyundai R549 900 (R629 900 for the top-spec AWD model) and the BMW R578 629 (R618 850 for the M Sport model) – but rampage through the options list and it’s not difficult to come within spitting distance of the Land Rover’s price. 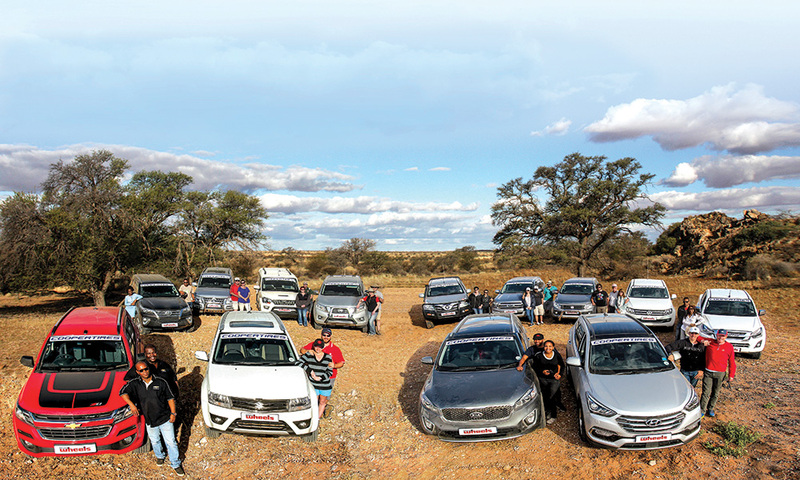 The BMW and Volvo, as tested here, have been specced up thoroughly, leaving the Santa Fe as the best value option in terms of toys per rand. But even if you do go box-ticking bonkers, you’ll still struggle to match the Discovery Sport’s vast battery of equipment and features. Perhaps it’s not entirely without merit, then. There’s still much that the Land Rover needs to do, though, in order to overcome its obvious foibles. So to fully establish what it’s really like, we set off into the countryside south of Swindon. The Discovery quickly lives up to its “Sport” moniker. The suspension is fairly stiff, the steering hefty and the intent clear. It’s by no means a Porsche Macan, but this is an SUV – despite its size and apparent nature – that rewards the keen driver. Even though the roads are slick with a mixture of sleet, rain and mud, it retains an impressive amount of grip and turns in to corners in a precise, poised fashion. It understeers predictably when pushed but, other than an initial light tip onto its outside wheel, it corners in a flat fashion. Wind it out across some sweeping country roads and it tackles everything you throw at it with aplomb, feeling eager and enjoyable rather than unsettled. It’s only the powertrain that takes the edge off the experience. The 2.2-litre diesel puts out 140 kW and 420 Nm, enabling 0-100 km/h in 8.9sec – not earth shattering, but more than enough for its class. 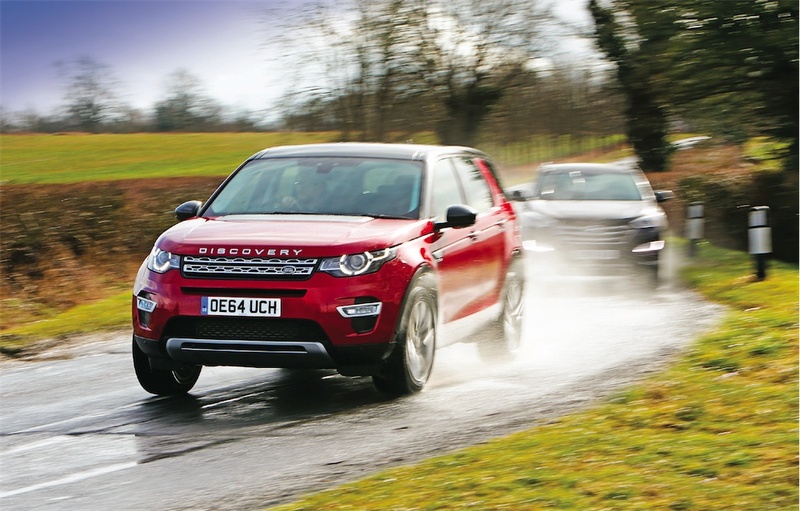 Peak torque is generated from a low 1750 r/min, so once the Discovery Sport is rolling, it surges along eagerly. The engine isn’t particularly quiet, though, and its vibrations occasionally intrude into the cabin. The nine-speed automatic gearbox could be better as well. From a standing start, it hesitates to transmit drive, making it difficult to execute a prompt getaway. Additional throttle application results in nothing more than an even more vigorous take-off when it actually responds. You soon learn to drive around it, but it’s still a disappointment. The consolation is that gear shifts are otherwise prompt and quick, even when commanded manually via the paddles, and the engine pulls heartily enough through its rev range. Braking power is excellent, too, and easily judged. 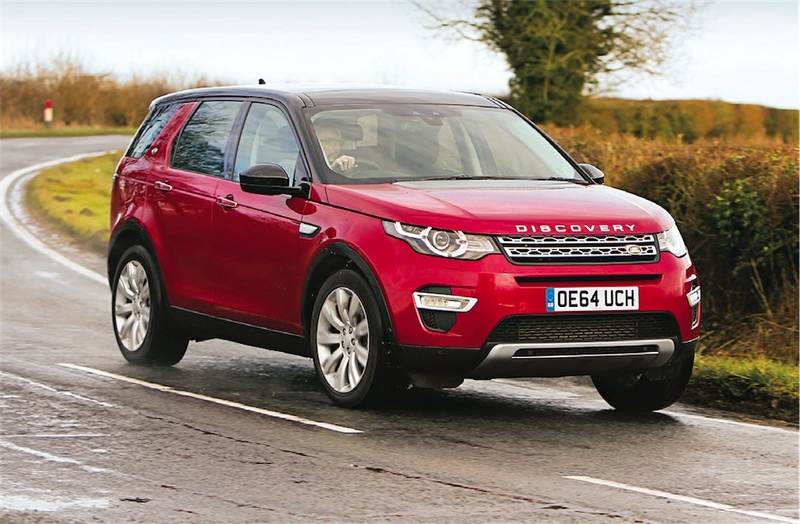 Once up to cruising speed, the Discovery Sport’s firm ride doesn’t translate into discomfort. It lopes along with ease, in a settled fashion, and the quiet cabin makes longer trips easy to endure. There’s a vast amount of space, too. The quality of the cabin is acceptable, but there are some easily marked plastics in places. It is functional and logical rather than elegant and inspirational. There are foibles, though, such as a panoramic roof that doesn’t extend forward far enough to make much difference to front-seat occupants. Unlike the terrain-following Land Rover, the BMW has much more compliant suspension that allows for a moderate amount of body movement. It feels softer which, in conjunction with lighter steering, delivers a more cosseting feel. 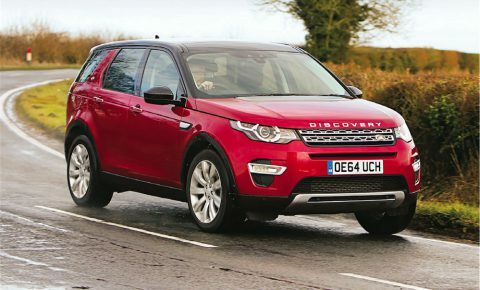 Our car was fitted with optional variable damper control, which allows for stiffer suspension when desired but still not to the extent of that found in the Discovery Sport. Regardless, many may find the X3 easier to get along with because of its less sharp nature. This is evident in some of the specifications alone — the BMW’s steering is three turns from lock to lock, whereas the Land Rover’s is a more hyperactive 2,4 turns in Sport mode. 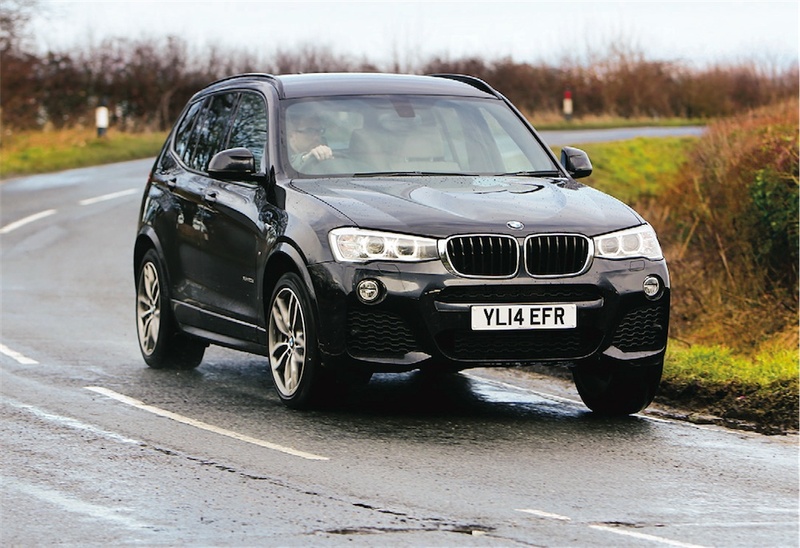 The X3 will tighten up and corner faster than the Discovery Sport, but not in quite such a rewarding fashion. The BMW may not be as exciting to drive as the Land Rover, but it does feature a much more competent powertrain. Its two-litre diesel puts out 140 kW and 400 Nm, and although on paper that doesn’t match the Land Rover on torque, it feels more eager at lower revs. This snappy response is bolstered further by the eight-speed automatic ’box which rifles through its ratios in a suitably prompt fashion. It doesn’t downshift as unnecessarily often as the Land Rover, but it does intermittently hang on to the gears for a little too long and labour the engine. The BMW’s diesel isn’t a particularly refined one, either, but it is a little less boomy than the Discovery Sport’s powerplant. There’s loads of space inside the BMW, although it’s purely a five-seater. The interior isn’t as cohesive as the Land Rover’s. It looks like a scaled-up 3 Series and doesn’t quite fit the car correctly, but the quality of the materials is generally very good. Its switchgear, particularly, feels delightfully well damped and securely fixed. 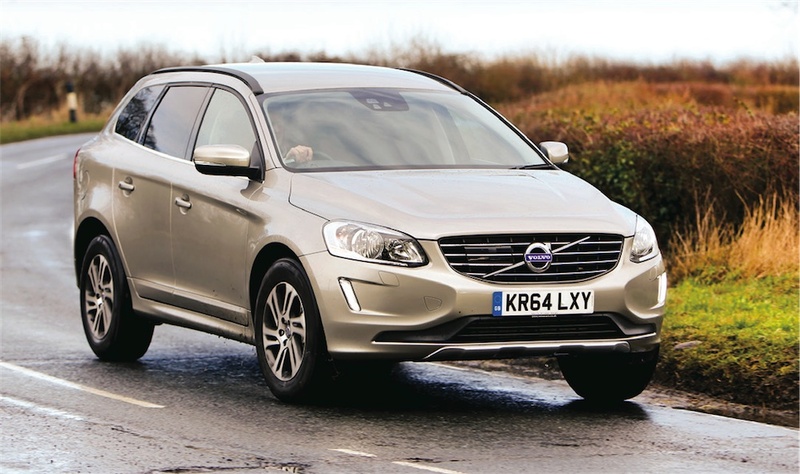 The XC60 outdoes both on the comfort and refinement front. It also has the most aurally gratifying diesel of the lot. The 133 kW, 400 Nm two-litre motor delivers a prompt, lively performance, unburdened by the frictional and weight penalties incurred by a four-wheel drive system. However, the Volvo falls down in two respects. Firstly, although the cabin is easily the most visually appealing of the cars here, and front space is excellent, the rear is quite cramped. Secondly, there’s not much to reward the driver. Although it damps out the bumps well and tolerates the curves adequately enough, there’s little in the way of feedback – and the harder you push, the more notably the flaws in its chassis become apparent. Unsettlingly, there’s sometimes pronounced steering kickback in long, sweeping high-speed turns. Its lack of four-wheel drive, in this specification at least, stunts its overall rating slightly, too. Accelerate with anything resembling vigour out of a vaguely damp junction and it’ll easily overpower the front wheels. You’ll also notice some torque-induced pull if you’re driving at speed through corners. That said, the eight-speed Geartronic automatic works well, although shifts aren’t executed as quickly as those in the BMW or Land Rover. 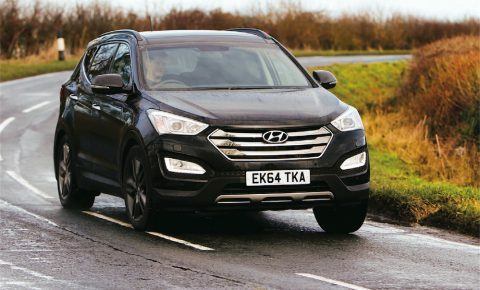 The Hyundai is the slowest car here, on paper, but it doesn’t feel as though it gives up much to the others in the real world – in part, thanks to a substantial 436 Nm at low revs from its 2.2-litre diesel engine. The 145 kW unit is pleasantly quiet, too, and ideal for simply cruising around. Similarly, the six-speed automatic transmission operates in an unobtrusive fashion and, unlike the Discovery Sport, the Santa Fe will happily trundle away from junctions without hesitation. Its interior isn’t exciting or as well finished as the others, but it feels durable. It’s a shame the seats lack lower back support, because they can become tiring to sit in on longer trips. Outside of that, then, the Hyundai majors on everyday usability. It is spacious, well equipped and immensely easy to drive. But although it has its strong points, it’s the most amorphous car within this group and it doesn’t leave much of a lasting impression. It’s worth noting that the Discovery Sport is not a particularly efficient mode of transport, averaging 8,6 l/100km during our test against a claimed 6,3 l/100km. 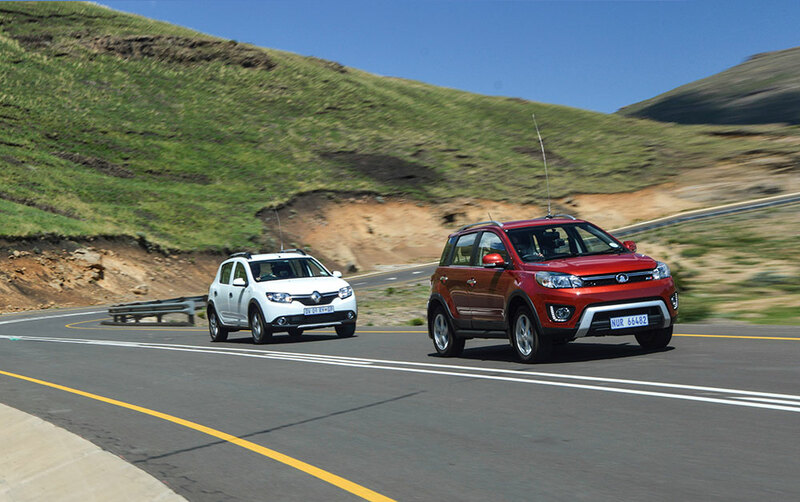 Its rivals, that are claimed to average between 5,4 l/100km and 4,7 l/100km, returned closer to 7 l/100km without effort. We pitch back onto the motorway, heading towards the centre of Weston-Super-Mare before hitting its fine beaches to conclude our test. It’s at this point that, despite my initial reservations and after having spent some four hours behind the wheel of the Discovery Sport, I realise I’m enjoying driving it. Compared with the other cars here, it’s more exciting, interesting and desirable, and by such an extent that its foibles eventually pale into comparative insignificance. Furthermore, it’s the Land Rover that feels as though it could conquer a mountain, and that’s what many look for in an SUV, regardless of whether they’ll ever venture off the beaten path. The BMW is unquestionably an impressive piece of machinery, but it lacks the Discovery Sport’s on-road verve and practical edge, landing it in second place. It does offer a more relaxed, rounded performance, but the Land Rover transpires to be the kind of car that you step out of and, with a glance backwards, quietly wish you could continue driving. For a four-cylinder diesel SUV, that’s an impressive feat. 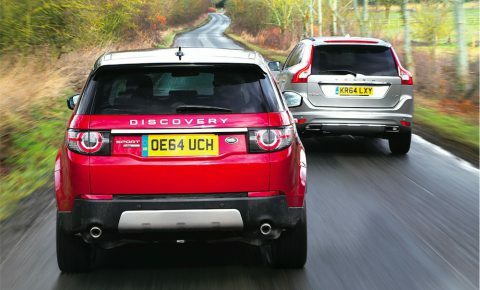 Unless you absolutely, positively must have the newest car on the block, however, you’d be advised against buying a Discovery Sport now because the new, modern Ingenium engines are due soon. Their fitment will hopefully combat the Land Rover’s lack of mechanical refinement, unimpressive fuel economy and occasionally sluggish responses. Onwards and, aptly for a Land Rover, upwards.